Communist Party Manifesto in 1848 is more relevant today than at that time. The number of communist countries has fallen from 15 in 1989 to only 4 today. However, communist parties are today part of a government in 12 countries; and communist parties exist in virtually every country in the world. 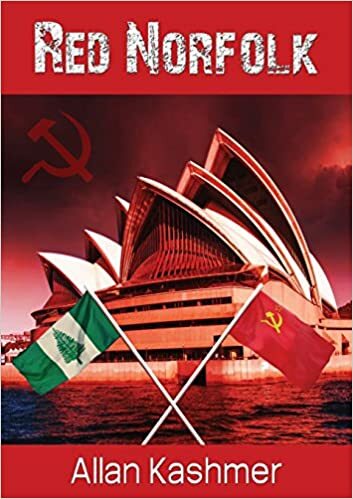 In the novel RED NORFOLK, a small group of communists seek to overthrow the democratically elected government by a carefully planned coup against the government. The group is aware of historical precedents, most notably the Russian revolution of 1917 which, far from being a mass uprising against the government, was actually a coup led by dedicated militants. The novel proposes that the Australian government decides to abolish cash. This assists the revolutionaries in achieving their goals. Nilson publisher David Robertson has already concluded that “the technology now exists for a paperless (without cash) society”. Whilst not wishing to alarm the reader of the prospect of militants taking over Australia, the author seeks to alert the reader to the possibility of such an event unless measures are taken by the authorities to prevent such a possibility. Red Norfork by Allan Kashmer is a stunning yet frightening read. It gives readers a taste of a possible outcome if actions to prevent it are not taken. The realities of such a treat in the future could happen. I applaud the writer of his superb writing and elegant tale. I easily found myself deep into a government conspiracy story. One that made me sweat in fear and wait with holding breath. Inside, Red Norfork, readers will meet a group trying to abolish the use of paper currency. Their thoughts are that everyone uses credit or debit cards now, and hardly anyone uses real cash. However, there are other dark characters whose businesses rely heavily on the flow of paper cash to survive. If the flow of paper cash demolishes…so, too, will their businesses. Bad guys going after other bad guys…then there’s the Communist Party members that are working up a plan to overthrow the Democratic party. I enjoyed reading this military strategic novella and governments fighting one another. Definitely an interesting read that will hook readers instantly. I found myself lost within the pages. The scenes went by fast. History and military fans will love, Red Norfork. Overall, I highly recommend it to all.